An easy guide to the most common religious symbols and their meaning. Click on the symbols below or on the links to the left. Welcome to religious symbols, a page for those who are interested and want to know more about religious symbols. Their structure, history, background and significance, etc. I myself am very fascinated with religious symbols and has for a long time researched and compiled the most common and interesting ones that I want to share with you. 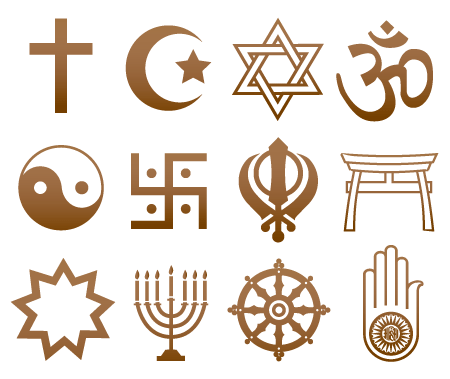 So far I have compiled symbols from the following religions, Baha'i, Buddhist, Christian, Hindu, Islam, Jain, Juaic, Shinto, Sikh, and Taoist. I will constantly develop the website aims to be the best source on the internet for religious symbols and their meanings. Symbols are a quick way to communicate often complex ideas. Religions usually employs a large amount of symbolism to represent their beliefs. Religious symbolms has a long history that is over 100,000 years old.